Joshua Casteel was 24 years old when he learned he would be sent to Iraq as an interrogator with the 202nd Military Intelligence Battalion. This was his first deployment. It was June 2004, and the war in Iraq had been going on for a little more than a year. Casteel packed a copy of the Book of Common Prayer and didn’t stop reading until he saw the lights of Baghdad in the desert below. From Ali Al Salem Air Base, outside Kuwait City, he took a military bus overnight to Baghdad International Airport. Out his window he saw oil fires, roadside weddings, sand that went on forever. The next day, he suited up in body armor, strapped on his M-16, and took a heavily armored three-vehicle convoy 20 miles outside Baghdad to Abu Ghraib prison. On the way, he was thinking about Pope John Paul II, who wrote about suffering, human dignity and the nature of personhood and its relationship to the divine. Then the commander asked about newcomers: “Who has never done this before?” Casteel raised his hand. The commander explained that they didn’t fire warning shots. “If you move your selector level from ‘safe’ to ‘semi’ automatic, you shoot to kill,” he said. Casteel stood 6-foot-1 and weighed 240 pounds. He was a blond, blue-eyed evangelical Christian from Cedar Rapids, Iowa. The deployment came six weeks after the revelation of prisoner torture and abuse at Abu Ghraib shocked the world. An Army intelligence officer and a patriot who’d long dreamed of serving his country in uniform, Casteel also had doubts about the morality of the so-called war on terror. Two weeks before he got his assignment letter from the Army, he was accepted to seminary school. He chose Iraq. Abu Ghraib was already a prison before the Americans arrived, where Saddam Hussein incarcerated, tortured and executed Iraqi dissidents. When Saddam’s regime collapsed, the Americans took the place over and replaced Saddam’s portrait with a banner that read “America is the friend of all Iraqi people.” There was hardly any vegetation, just expanses of dirt and mud between buildings. “At the prison’s edge is a teetering skyline—minaret, palm trees, the mosaic dome of a mosque, rooftops,” Casteel wrote home to his parents. “At sunset I can hear the calls to prayer from the south and from the east. At times it may even appear as if in a round, like choirs of a cathedral, one folded atop the other. But always a few hours after the sun has fallen there is the intermittent echo of small-arms fire, the howling of dogs.” The complex, which now also housed a U.S. military base, had a chapel, a couple of cafeterias, an entertainment shed. When Casteel got to his sleeping quarters, everything was covered in ash. Outside, he saw a plume of smoke from a giant trash pile. The pit burned 24 hours a day, seven days a week. Sometimes the smoke blew right through Casteel’s sleeping quarters. Casteel was told that the military’s top priority, above even the search for Osama bin Laden, was to hunt down Abu Musab al-Zarqawi, the leader of Al Qaeda in Iraq, and nicknamed the “Sheik of the Slaughterers.” Casteel’s job would be to interrogate prisoners to learn more about Zarqawi’s chief lieutenant, a man named Omar Hussein Hadid, whose army of insurgents had killed 95 Americans with rocket-propelled grenades and crude bombs during the Battle of Fallujah. I met Casteel in 2009, when we were both graduate students in the writing program at the University of Iowa. We took a class together on the art of memoir, and on the side, Casteel told me, he took courses in philosophy and theology. I was surprised when I learned he had been an interrogator at Abu Ghraib prison. He wasn’t like any soldier I had ever met. He loved to sing solos from Les Misérables and gave frequent sermons at local churches. I often saw him in a corduroy blazer, books piled under one arm. There were folders for academic papers, diary entries, plays—Casteel got a dual master’s degree in playwriting and nonfiction writing—and many jotted-off musings. A small publisher, Essay Press, had put out a short book by Casteel in 2008 titled Letters from Abu Ghraib, composed of selected emails he wrote to friends and family during his six-month deployment. And there were a lot of unfinished projects, including a memoir called No Graven Images. 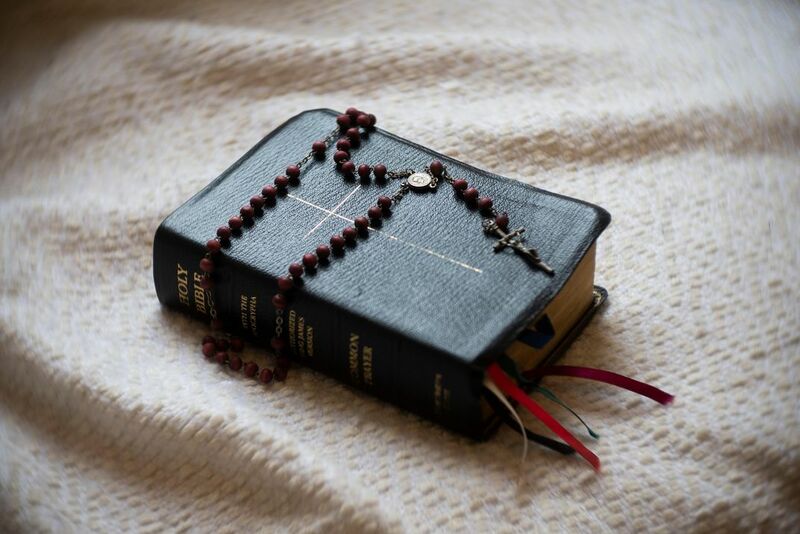 Casteel’s Bible and rosary from Iraq. He wrote that he often sat in Abu Ghraib’s chapel with his Bible pressed to his forehead, even after finishing his prayers. Casteel was born into a family of evangelists and raised in Cedar Rapids. His father was an ordained minister with River of Life Ministries, and both of his parents worked as Christian marriage therapists. Joshua was the youngest child of three, and the only boy. For years Casteel soaked up the ecstasy of Pentecostalism, spoke in tongues, attended miracles. On Sundays, he listened to sermons, Scriptures, hymns, and learned about the fight between good and evil. He was a kid driven by questions of meaning and significance. He lived with what people now like to call “intentionality.” He told his mother he wanted to give himself up to a higher cause—either his country, or God, or both. He even told his mother that his calling might include the ultimate sacrifice. He covered his bedroom walls with cutouts from Army brochures and Marine recruiters, the American flag and the U.S. Constitution, and a large wooden cross. Casteel was consumed by feelings of loyalty to America and believed in America as a “Shining City on a Hill.” His father had been a captain in the Army, and his grandfather had fought in World War II, Korea and Vietnam. At his grandfather’s funeral, Joshua placed an old West Point badge in his casket. Casteel at ages 12 and 24. He was raised to equate love of God with love of country, a “patriotic, Evangelical Christian, high-school valedictorian,” he once wrote. Kristi Casteel describes her son as a happy and affectionate child, obedient as they come. The two forged a close and trusting relationship right from the beginning. One day when Casteel was 3 years old she found him sobbing uncontrollably. He brought her outside. “It’s really bad,” he said. “A little worm is dead.” The worm had dried out in the sun. Casteel dug a tiny grave and buried it. “Jesus loves the little wormies,” he told his mother. “All the little wormies of the world.” As a teenager he made small but symbolic acts in the name of God. He torched his collection of unholy CDs. He anointed the high school doorways and baseball dugouts with oil from the Christian bookstore. He blew a shofar from centerfield. His mother said he could sometimes get lonely, staying home on weekends rather than partying or socializing with other teenagers. He didn’t drink or do drugs. Some of his friends took to calling him “Mama’s Boy.” Other classmates thought he was gay because many of his friends were girls, because he acted in school plays and musicals, because he had a hormone imbalance called gynecomastia that gave him breasts. For years, until he had surgery, he was teased in the locker room, and refused to take off his shirt to swim or change backstage during school plays. Kristi had always worried that God would take her son. She had gone into his bedroom at night when he was a few weeks old and heard God talking: Give him back to me. You need to let him go. She tried to make sense of it. She later thought of the story of Isaac, when Abraham raised a knife above his son’s head to prove his faith in God. 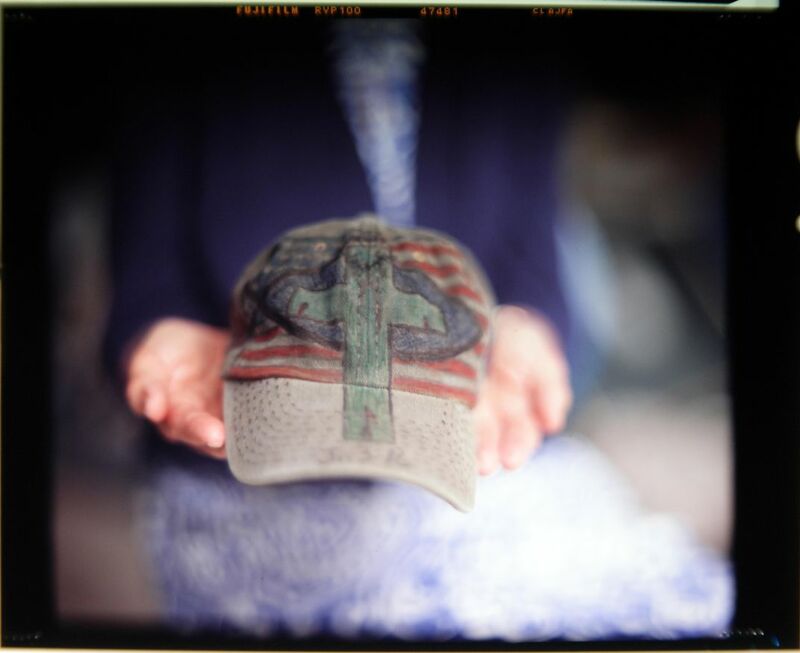 Casteel’s cap with hand-drawn cross, American flag and Jesus fish. “He was never afraid to express his faith,” his mother says. Casteel never forgot Steve’s prophecy, and a month after he turned 17 he enlisted as an Army reservist in Iowa City under the delayed entry program, in part to help his chances of getting accepted to West Point. That summer, between junior and senior year of high school, Casteel joined hundreds of other recruits for haircuts, immunizations and barrack assignments at basic combat training at Fort Leonard Wood, Missouri. At bayonet practice, he learned to impale a body with a footlong knife affixed to an automatic assault rifle. The soldiers thrust bayonets into dummies and repeated a chant: “Kill, kill, kill without mercy, Sergeant! Blood, blood, bright red blood, Sergeant! Blood makes the green grass grow!” Casteel stumbled and found that he couldn’t repeat the words. During his senior year he applied to West Point, Wheaton College and Notre Dame. Casteel prayed to God for a sign, because he was having doubts. He found he was more drawn to a life in academia, maybe even the priesthood, than one in the military. But the rejection letter from Notre Dame arrived the day after his prayer, and this was followed by an acceptance letter from West Point. He matriculated in June 1998. In his civilian duffle he packed a copy of Joseph Conrad’s Heart of Darkness. “Is this where you feel God has led you?” his father asked. Casteel said it was. 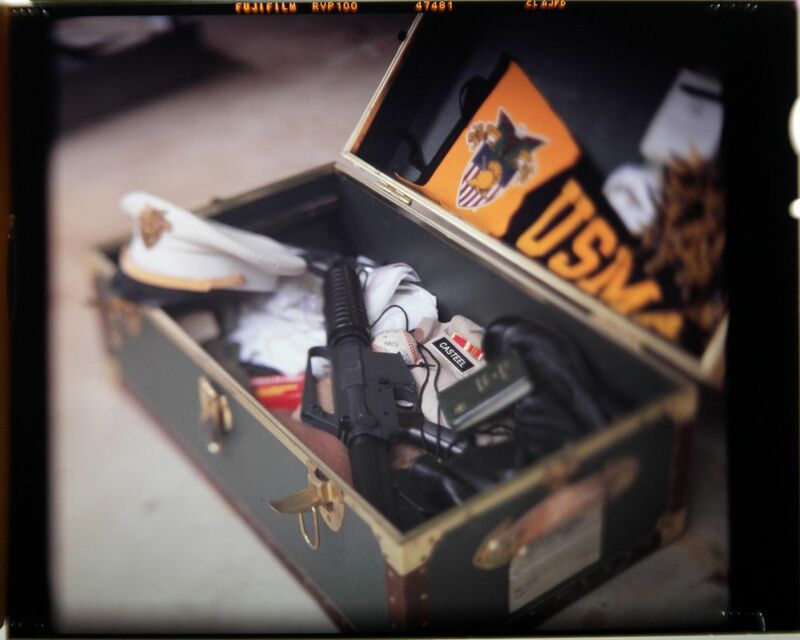 But he quickly found that he was miserable at the military academy. The academic environment was highly restrictive. The cadets lacked creativity and pandered to expectations. He didn’t feel the camaraderie. Sometimes he’d drink a couple of canteens of water at night so he’d have an excuse to read Edgar Allan Poe in the bathroom. Poe had attended West Point. He lasted seven months. Casteel lasted three. The night before he quit he was so nervous he polished a hole clean through his garrison cap. He left on a lonely Saturday in September, not knowing whether he was walking away from God’s plan for his life, or walking into it. But the attacks of September 11, 2001, four months before he left for Oxford, hung over Casteel’s time abroad, and as the U.S. government began to talk about war Casteel’s demeanor changed. He started lifting weights, getting huge. He talked to friends about quitting school and joining a war that was at first officially named Operation Infinite Justice. Casteel graduated from the University of Iowa in May 2002, and that September he entered the basic interrogator course at Fort Huachuca, in Arizona, home to the Army’s military intelligence center. Soon after, he enrolled in the immersive language course at the Defense Language Institute Foreign Language Center, in Monterey, California, to study Arabic. His zeal for serving his country was matched, even fueled, by his faith. While in Monterey, he befriended an Episcopal priest at a nearby church named Father William Martin, and again thought about becoming a priest, maybe even an Army chaplain. Then Casteel traveled to Seattle to attend a lecture by a pacifist theologian from Duke University named Stanley Hauerwas, who believed that Christians ought to remain nonviolent even in times of war. The lecture haunted him. After the talk, Casteel walked up to Hauerwas and asked what a Christian already enlisted in the military should do. Hauerwas replied that he should leave the military right away—get as far away from it as possible. Casteel applied to divinity school, and meanwhile he obsessively read the literature on “just war” theory, pacifism, ethics and international relations, the politics of nonviolence, the writings of Pope John Paul II, of Martin Luther King Jr., Gandhi and the pacifist monk Thomas Merton, as well as the history of the Mennonite tradition and of pacifism in the Roman Catholic and Anglican traditions. Then, in May 2004, he was accepted to seminary at the Graduate Theological Union in Berkeley, California. 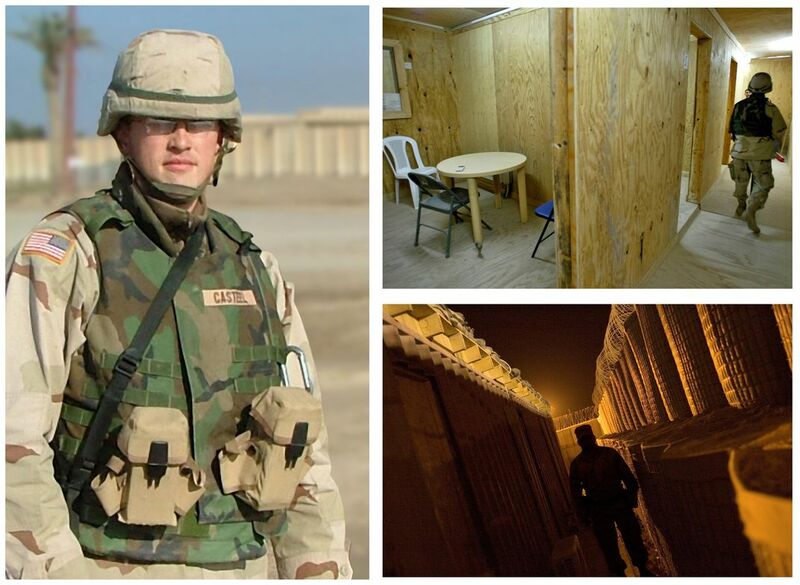 Two weeks later, his deployment letter to Iraq turned up in his mailbox. 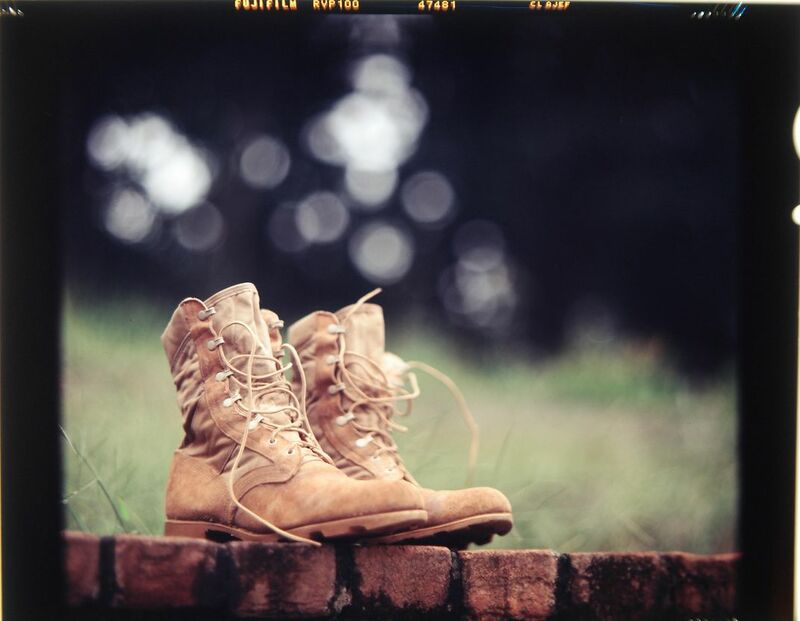 Casteel wore these combat boots at Abu Ghraib. At Abu Ghraib, Casteel woke at 5, exercised, prayed, slipped on 70 pounds of body armor and walked through 120-degree heat to work. Mornings were for preparation, afternoons for interrogations. Some mornings he researched insurgent groups, their cell structures and fighting tactics, or scanned satellite images of American and mujahedin traffic-control points. Almost every day he read inventories and personality biographies of terrorists. For some interrogations, he received a pile of background information on the man he was scheduled to interrogate. Other times he walked into the interrogation room knowing nothing at all. He prepared to encounter a range of prisoners, from bloodthirsty adolescents and Al Qaeda fanatics to good people in the wrong place at the wrong time. Mostly he interrogated good, normal people—Iraqi schoolboys, taxi drivers and imams. Between interrogations he read commentaries on the New Testament and Western philosophy and brushed up on his biblical Greek and Aramaic to reread key scriptural passages about the ethics of soldiering and violence. People learned pretty quickly that he’d been accepted to seminary school before his deployment to Iraq. Everybody called him “Priest.” Some fellow soldiers took to confessing their sins to him in the Abu Ghraib bathroom stalls. In August 2004, Casteel was promoted to the rank of sergeant—a goal he’d set from the very beginning. “I wanted the leader’s post of a working man,” he wrote home, “to earn my stripes and my respect from a job well done, earned by exertion, not by my college success.” It no longer felt like something to celebrate. The past weeks had seen him get angrier and angrier—at the execution of the war, the failure of the Americans to find weapons of mass destruction or establish a link between Iraq and the attacks of September 11, at the helplessness and misery of the vast majority of Iraqis, pawns in a larger struggle between violent extremists on one side and an invading foreign army that, even granting their good intentions, routinely killed Iraqi civilians. And he was incensed by the way American politicians used Christian language to justify the war. At lunch Casteel ate with local Iraqi workers instead of Americans, and grew tired of the way the Americans mocked the country. He ate enormous amounts of food to relieve stress, or sometimes he didn’t eat at all. He lost and gained weight, smoked cigarettes, drank excessive amounts of coffee. He stayed up late reading because he didn’t want the next day to come. He read so much that even during mortar attacks he shopped for new books on Amazon. Another book by Stanley Hauerwas, Wittgenstein, Derrida, Aquinas, Kant. Another treatise on Christian pacifism and the kingdom of God. He was looking for answers, or an excuse to get out of the war, or an excuse to stay in it. It was a fair question. It was the question that had haunted him ever since he had arrived, and though he didn’t admit it, Casteel was far more afraid of killing than of being killed. Casteel’s left hand was in his pocket, gripping the crucifix on his rosary. The prisoner counted prayer beads in his right hand. “I will have to think about it,” the prisoner said. Casteel had spent his whole life preaching the word of Christ, and now his words were being returned to him by a jihadist in a gentle, evangelical tone. Every challenge to the prisoner came back as a challenge to himself. It was clear the jihadist had peace because of his belief in Islam. He told Casteel that if he was put in prison and never released, he would be okay with that, because he was acting justly, in accordance with his faith. Did Casteel have that same kind of peace? “What is terrifying is that this jihadist genuinely wanted my conversion,” Casteel wrote afterward. “And I felt him actually care for me, desire for my good.”Casteel’s job as an interrogator faded to the periphery. Finally, he succumbed. “You’re right,” he said to the jihadist’s gentle admonishments. Casteel walked out of the interrogation room and told his superiors that if they wanted to continue interrogating this man, it would have to be done by someone else. It was soon clear to Casteel what he had to do. He would apply for an honorable discharge as a conscientious objector, which meant he’d have to prove not that he simply opposed the war in Iraq, but that he had a “firm, fixed, and sincere objection to participation in war in any form or the bearing of arms, by reason of religious training and belief.” Not everybody was supportive. He had already been exchanging long, anguished emails full of competing interpretations of Scripture with his father, who as a devoted Christian conservative couldn’t understand his son’s righteous turn against the war. Christ had been misunderstood, too. When Casteel returned to Abu Ghraib, he told his commander he could no longer serve in the Army. He believed his job as a soldier and interrogator contradicted his obligations as a Christian. It had been two weeks since his encounter with the jihadist. While Casteel waited for approval, the Army gave him something to do outside of the interrogation room. He was given trash duty, which meant he helped to pour jet fuel onto the waste in a different pit from the one burning day and night near his sleeping quarters. The military burned paint and plastic and batteries and ordnance. It burned Styrofoam, petroleum, soda cans, medical waste, human limbs. For weeks, Casteel worked right on the edge of the pit, making sure the fire didn’t spread. Casteel in his signature corduroy blazer in 2007. He returned to Iowa in January 2005. In May he was honorably discharged as a conscientious objector, one of the few service members to apply for and receive approval in the early years of the Iraq War. It was perhaps the only decision he made with absolute clarity in Iraq. Casteel described coming home as “like stepping into the twilight zone.” His second day back, his sister Rebekah brought him to a mall in Cedar Rapids to buy him a leather jacket, a late Christmas present. He slipped the jacket over his arms and looked in the mirror. “Two days earlier I’d been in Kuwait, toting an M-16; three weeks before that, in Iraq, strapped in body armor and aiming that same M-16 at little boys,” he wrote to a friend. “I don’t know how to go from flak vests and assault rifles to fashion cycle jackets.” He suffered from depression and post-traumatic stress disorder. Strangely, he missed the clarity of war. Everything over there came down to life and death. Many nights he drank. 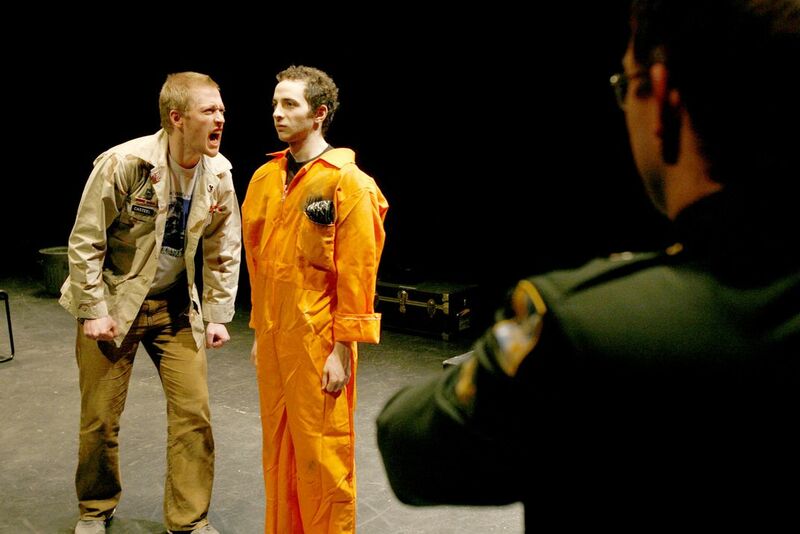 Casteel in the role of interrogator during a dress rehearsal for his play Returns, at the University of Iowa in 2007. Kristi Casteel and her dog, Angel, in front of boxes of Joshua’s personal effects at the Maryland home of her daughter, Rebekah Latchis. In Iraq, Casteel had started to cough up a thick black mucus. Lots of other soldiers were doing it too. “It’s no big deal,” they said, just “Iraqi crud.” Besides, Casteel had suffered from allergies since he was a child, and Abu Ghraib was full of dust and sand and smoke. Now back in the States, Casteel was often congested and coughing. Doctors at the Veterans Affairs hospital told him he had asthma. He walked out with a prescription for Albuterol, a common asthma medication. When he returned, they prescribed more inhalers. 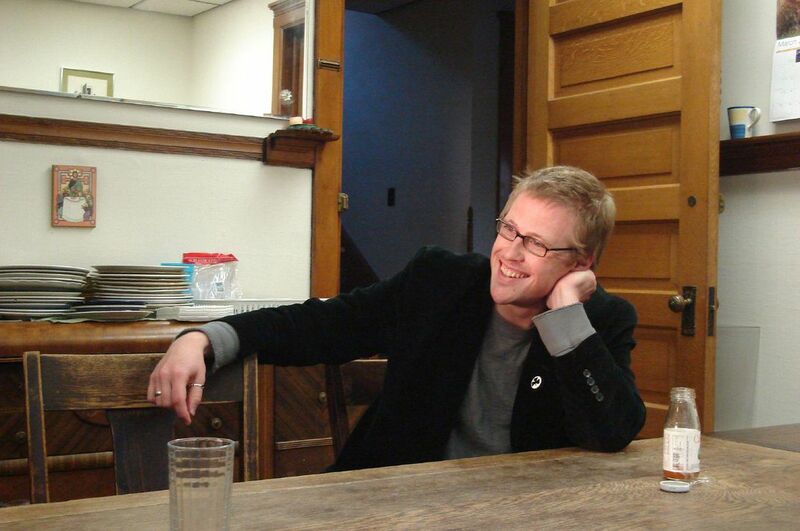 Over the next few years, Casteel wrote and traveled widely, lecturing about his experiences across the United States and in England, Ireland, Sweden and South Korea. He was invited to the Vatican to speak to officials about the church’s role in advocating nonviolence, and a photograph of Casteel shaking hands with Pope Benedict XVI now hangs in the offices at the Catholic Peace Fellowship in South Bend, Indiana. The next year, after enrolling in divinity school in Chicago, and getting a job teaching a graduate writing workshop, Casteel began exeriencing terrible back pain. He visited the chiropractor but nothing helped. At home in Iowa, his mother drove him to the VA. The doctors diagnosed bronchitis. They sent him home. On Halloween, he coughed so hard something snapped in his back. At the emergency room, the doctors took X-rays for the first time and discovered a mess of tumors in his lungs. The next morning, Casteel called Kristi and told her she needed to come to the hospital. He didn’t tell her that the doctors said it was probably cancer, because he didn’t want her worrying during the drive. She was frantic. In the waiting room, she held a pamphlet she’d tossed into her purse on her way out, and read the same line over and over, something about protecting us from evil, from the onslaught of the enemy. Then the doctors walked in and announced that her 31-year-old son had Stage 4 adenocarcinoma, cancer of the lungs. They said this was rarely found in otherwise healthy young men—mostly it affects geriatric patients and Asian women. Joshua had tumors in his lungs, liver and spine. Later it would spread to his arms, legs and finally to his brain. Kristi fell forward onto the floor and started sobbing. She cried so hard the maintenance man dropped his tools and ran over to comfort her. Joshua came out. “Do you know?” she asked him. He said he knew. “But I don’t think I’m done,” he said. “I have too much to do.” He wanted to finish his PhD. He wanted to start a magazine and a film company. He had a memoir to finish. He thought he might want to have a family, or enter the priesthood—he hadn’t given up that dream. I’m not going to die because I haven’t been made a priest yet, he told himself. Casteel visited a lot of specialists. The pain was so bad he slept an hour at a time. He had spinal surgery, radiation therapy, chemo. His hair fell out. Fall turned to winter, then spring, then summer, and not 20 minutes passed without pain. He used a cane to walk. People visited him and prayed. Orange. Do you think maybe the cancer has anything to do with Iraq? she asked. His friend told him respiratory illnesses were being diagnosed in many soldiers returning from the war, and some doctors were connecting them back to the burn pits. The condition was called “Iraq/Afghanistan War-Lung Injury.” Some families of veterans had started a registry to document those affected, and were talking about lawsuits. The burn pits were used on U.S. military bases throughout Iraq and Afghanistan to get rid of waste even though incinerators, safer mechanisms for disposing the waste, often sat unused. Casteel had slept 100 yards away from an enormous burn pit and in his final weeks he had manned a second one. The connection had never occurred to him. He had never used a mask when he worked. His concerns had been metaphysical. In November 2011, his muscles spasmed from his waist up. Casteel was in agony, lips locked between clenched teeth. At the hospital, Kristi lifted her son and walked him around like a marionette, because the nurses wouldn’t help. She had to scream at a nurse in the hallway to persuade her to give Casteel a shot for the pain. Kristi took Casteel home to Cedar Rapids in December. Two weeks later he had a seizure so strong the vertebrae in his spine collapsed. “I feel a sense of relief that I get to share in the suffering of the Iraqi people,” he told his friends and family. “Because the Americans burned toxins in their fields and on their earth. In a certain sense it’s an opportunity to climb up on the cross with them.” The war was a path for him to become more like Christ. “I think you’re going to follow in the footsteps of Christ,” she’d replied. “Me too,” he’d told her. 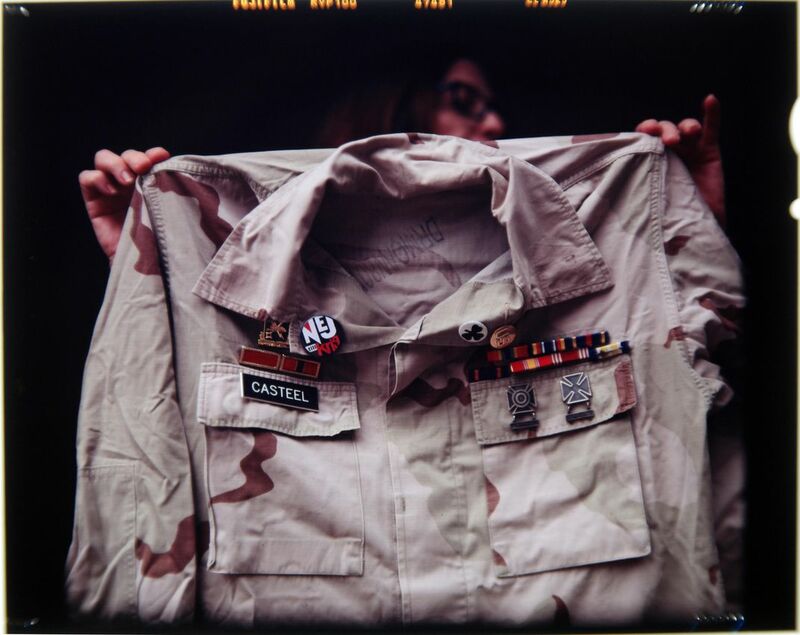 Casteel’s uniform “represents for me his long road from West Point to conscientious objector in order to gain his life message—one of love, justice and faith,” Kristi says. In early 2012, Casteel traveled with his mother to New York, where he would take part in a clinical trial of an experimental cancer drug. They lived at a housing center for cancer patients and their families in Midtown Manhattan called Hope Lodge. For a while Casteel was able to manage the stairs to the subway. But the cancer mutated and spread. When a nurse told him it was time for palliative care, he said he didn’t like the word “palliative,” which he knew came from the Latin for “to cover or cloak,” disguising the inevitable. Soon Casteel’s spine crumbled. He became emaciated. Movement was so excruciating that his eyes rolled back in his head. His mother and sisters took turns holding his arms above his head for hours, hoping it would relieve the pain. One Saturday, on the way to the hospital, Kristi passed a church with a statue that made her pause. It was the limp body of Christ, just after he had been pulled from the cross. That statue looks just like Joshua, she thought. Kristi walked to the hospital. She told her son how much she loved him. How he had been the joy of her life, that she could never have asked for a better son. “I think at that moment I knew what was coming,” Kristi said. In the days that followed he weakened to the point of no recovery. One afternoon Casteel started having a hard time breathing. Kristi fled to the bathroom. She couldn’t bear it. Then she began thinking about Mary, how it must have been for her when Jesus was going to die and return. Kristi had a necklace Joshua had given her with a blue heart, which to her symbolized Mary. In the bathroom, God told her, Don’t desert him now. This is his walk up the hill. He was climbing up on the cross. “When Joshua was near the end, that was the image that God brought to me,” Kristi said. “We were walking up the hill together.” It happened at 3:30 p.m. on a Saturday. 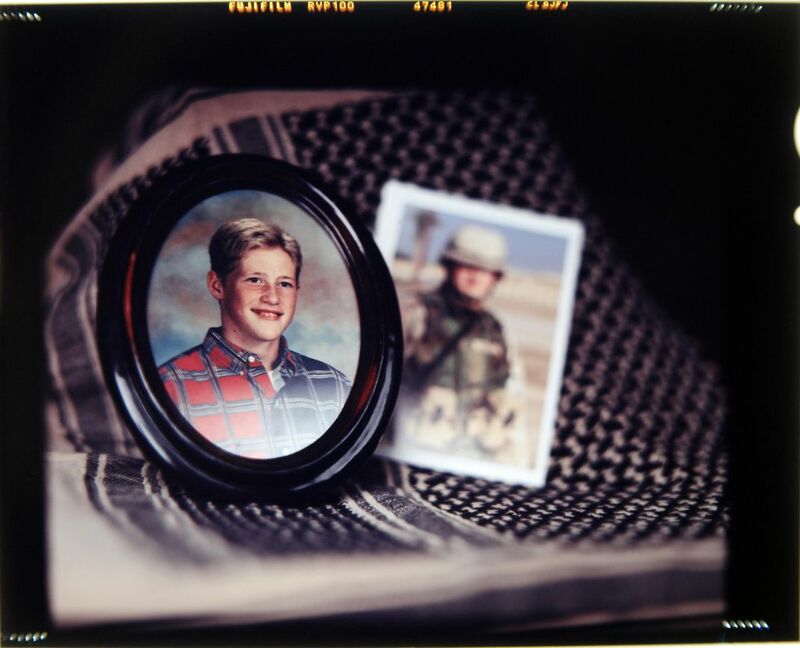 After her son died, Kristi established the Joshua Casteel Foundation, which raises awareness about Iraqis and veterans in need of help, in particular those affected by the burn pits. More than 10,000 veterans of the wars in Iraq and Afghanistan have filed medical claims connected to the pits, and the Department of Veterans Affairs has acknowledged that burn pit exposure is related to at least 2,200 of the cases. Kristi’s foundation also works with a Catholic community center in Alliance, Ohio, named the Joshua Casteel House.